MicrosoftThe Microsoft Surface Studio 2 can fold down into ‘studio mode,’ letting you draw and sketch right on its big, beautiful screen. The Surface Dial, seen on the right, is an optional accessory that’s sold separately. Meet the Microsoft Surface Studio 2: a big, beautiful, all-in-one PC that will be available on November 15th at a starting price of $US3,499. Like the original, it can fold down into “studio mode,” so you can draw and sketch on the screen. New to this model: a brighter screen with better contrast, plus updated graphical hardware and newer processors. Microsoft’s first-ever desktop PC is getting a big upgrade. Introducing the powerful Surface Studio 2, a mega-premium, all-in-one Windows 10 PC that will be available on November 15th for the mega-premium starting price of $US3,499. Like the original Surface Studio, which launched in late 2016, this new model comes with a 28-inch touchscreen that can swivel down into “studio mode,” letting you sketch and mark up documents right on your desk. If you’ve ever used a Surface Studio, you know that it’s smooth and weirdly addictive to raise the screen up and back down again. The Surface Studio 2 is much the same, but better and brighter – literally. Microsoft claims the new screen has “38 per cent higher luminance and 22 per cent more contrast” than that in the original Surface Studio. Under the hood, Microsoft says that the Surface Studio 2 is 50% faster than the original at file processing, thanks to new solid-state hard drives, plus more up-to-date Intel processors. Also, depending on which model Surface Studio 2 you buy, you’ll get NVIDIA GeForce GTXl 1060 or 1070 graphics hardware. It’s not a dedicated gaming machine by any means, but the Surface Studio 2 can make a reasonable go at playing just about any recent-release PC game at high graphics settings. Originally pitched as a super-powerful machine for creative professionals, the original Surface Studio was said to be something of a surprise hit – it sported a hefty $US3,000 pricetag, but reportedly blew away Microsoft’s internal projections. 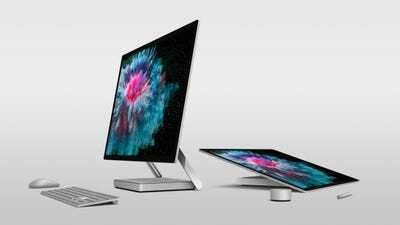 At a higher starting price tag of $US3,500, it will be interesting to see if Surface Studio 2 can repeat the trick. Also of note: The original Surface Studio could have been helped along by a perceived weakness with Apple’s iMac, the Cupertino titan’s own all-in-one PC, which in 2016 hadn’t seen a significant update in some while. This time, though, the Surface Studio will face stiffer competition – last year, Apple released a more powerful iMac Pro, and the rumour mill suggests the original iMac will get an update this year, too.